Iowa’s season was at another crossroads: They had just had a bad loss up at Minnesota, giving up 92 points and were still reeling off a huge, 2nd half collapse against Michigan State at home. The foe was #5 Michigan, and very few gave Iowa a chance. So what did, Iowa do? They went out and beat the Wolverines by 15 points. 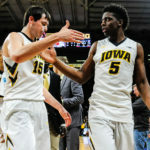 The win was as dominant as the score indicated, as Iowa led for 30:44 of the game’s 40 minutes against a Michigan team that prides themselves on controlling the tempo. The Hawkeyes forced the Wolverines to shoot 33 three-pointers, only making eight for them. Any doubts anyone had for Iowa’s defense were shut down for the night with their performance against Michigan. “We got beat by a better team, Iowa is a much better team than us right now”, said Michigan head coach John Beilein. “Their bench was terrific and they got us in foul trouble”. Michigan center Jon Teske fouled out with 3:15 to go in the game. Isaiah Livers had 4 fouls and Ignas Brazdeikis and Jordan Poole had 3 fouls each. The story of the first half was Ryan Kreiner and Joe Wieskamp. Wieskamp led the way with 16 points at the break, including multiple and-one buckets that seemed to come at crucial times for Iowa. Ryan Kreiner came up huge as Luka Garza sat most of the first half in foul trouble. Kreiner had 13 points at the break and provided a huge energy boost to Iowa in a time they needed it most as Iowa led at the break, 42-29. In the second half, Luka Garza came back with a vengeance, scoring 15 points against a hapless Michigan frontcourt that struggled with his post moves all night long. Perhaps the most impressive was shielding off Isaiah Livers for this two-hand dunk. “He was frustrated at first”, Iowa head coach Fran McCaffery said of Garza’s early foul trouble. “But he’s pretty mature now, he calmed down. He was good when he went back in”. 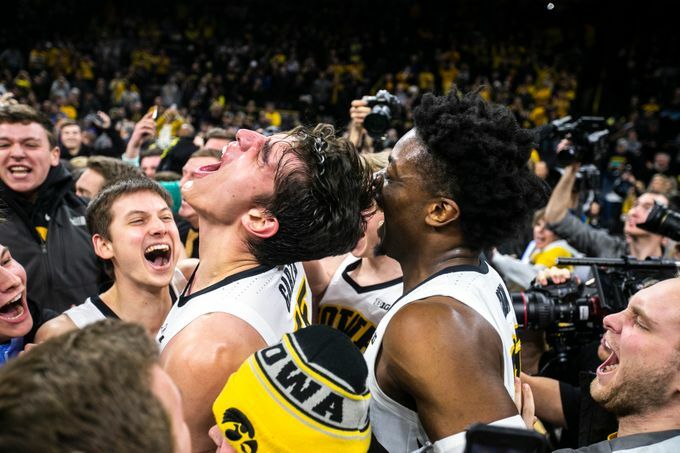 Garza’s second half helped bolster Iowa to a massive 74-59 win over the 5th-ranked Wolverines, capped off by a court storm no one is to soon forget. Iowa’s next game is Thursday night in Bloomington, Indiana against the Indiana Hoosiers, the game will be broadcast on either ESPN or ESPN2.